Our handler/canine teams can offer your conservation surveys unparalled efficiency and effectiveness. 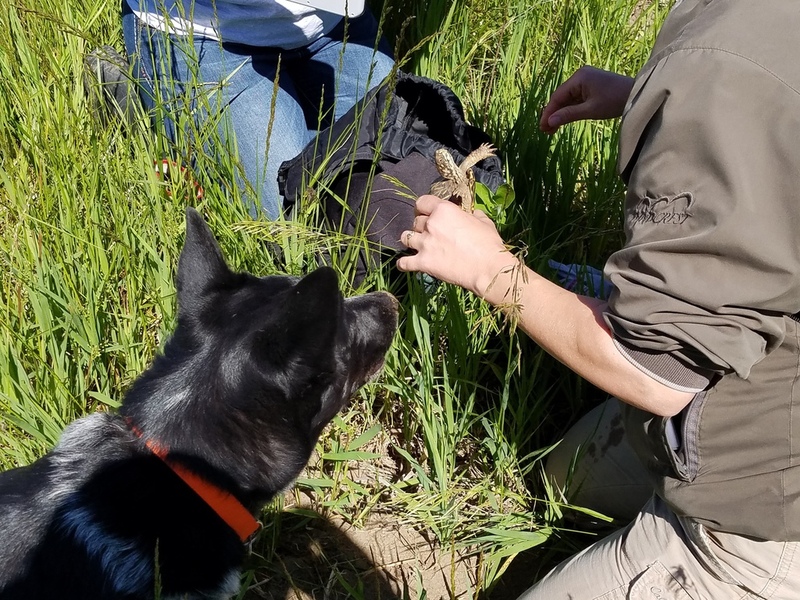 Once conditioned on the specific target scent source our detection dogs enthusiastically go to work searching for the species of your choice, like turtles or selected plants. When the dogs locate the the target species they give us an identifiable alert. They don't harm or mouth the target, they simply wait for us to provide their reward which is usually a ball or a frisbee. Based on your survey requirements, the handler defines the search area for the dog and the dog uses its amazing olfactory capabilities to search for the target scent. The handler searches visually and monitors the dog's behaviors. The dogs constantly sniff the air and the ground, sorting through a vast array of natural and man-made odors to locate the target scent source, which frequently is something so small that humans may never see it concealed in the water or ground cover. In ideal conditions a handler/canine can cover an acre of ground in a matter of minutes with a probability of success that is much higher than the traditional grid search conducted with humans alone. We will work with your researchers to structure the field surveys to best meet your needs. If wanted, we can count, photograph, and geotag each find. Our handler/canine teams can provide you with a greater degree of accuracy in a shorter amount time. Contact us to learn how we can support your conservation research projects. We can work by the day or by the project.